Johann Rosenmüller’s place as one of the most important and influential masters of the period between Schütz and Bach was researched and recognised by musicologists astonishingly early. Carl von Winterfeld wrote in 1845 in his expansive monograph titled Song in the Protestant Church and its relationship to the Art of Composition that Rosenmüller had «transformed the contemporary overall preferred Italian forms, which he had been fully imbued with during his long sojourn in Venice, into a genuinely vivid German style thus giving them a new cultural home; that which the subsequent 18th Century Masters achieved is mostly thanks to him.» In the last few years this insight has again entered mainstream consciousness, with Rosenmüller’s elegant and musically rich compositions winning new friends through concerts and CD recordings. …In the last years of his time in Leipzig Rosenmüller had already mastered the Italian style to the point that a colleague compared the music performed in the Church of the University of Leipzig to that which could be heard in St. Mark’s Cathedral (whether this was based on personal experience is, however, not indicated). 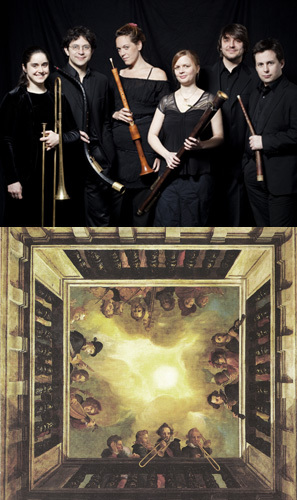 On the other hand, Rosenmüller’s Venetian concerti still offered enough «German gravity» to become mainstays in Middle and North German court orchestras. Clearly he was capable of consciously combining both stylistic spheres. This recording contains in greater part works from the some 25 year span of Rosenmüller’s Venetian residency. During this period he developed a similarly complex and unmistakable style in his extensive vocal and instrumental compositions that is exemplarily presented in these recorded works. «O dives omnium bonarum» is the setting of a meditation ascribed to saint Augustinus and notated by the theologian and reformer Andreas Musculus (1514–1581) from Brandenburg. The piece originates from the second part of a collection of sacred concertos penned by Rosenmüller and published in Leipzig in 1653, titled Kernsprüche. The polyphonic movement, made less through solistic concertante elements is here lent a particularly festive splendour as a result. Braunschweig-Wolfenbüttel and printed in Nürnberg, Rosenmüller presents in this collection the sum of the musical experience that he garnered in Venice. (Soprano and Bass) with an obligato cornett. Still more attention was lavished by the composer on the 112th Psalm «Laudate pueri Dominum», of which he penned no less than ten separate settings. The here recorded version with three vocal and seven instrumental parts shows a particular brilliant sonority. 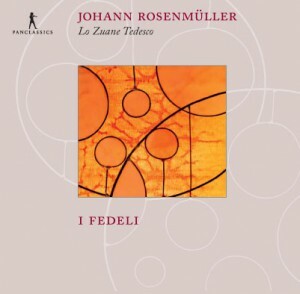 The quick triple time, the virtuosic coloraturas, the precise voiceleading and the concerto-like grouping of the three vocal and four treble instruments suggest this as a late work, and indicate the enormous stylistic development that Rosenmüller, and with him European musical history, underwent during the four decades of his creative activity.